You are here: Home / Search for "housing"
Seems like this is the 4th or 5th time an out-of-state developer has tried to use tax-credits to build a development near Ballentine Elementary that will cause even further infrastructure and crowding issues in our community. Every time, y’all have reach out to me and let me know your concerns and I agree step in to help. This time there are 35 projects applying . While I do not get a vote on these matters. I do get to share my response and ask that you share yours as well. While local zoning issues are county/town level decisions, from time-to-time members of the General Assembly are notified when an individual/developer is applying for state-tax-credits in their community. It seems that once again, the same out-of-state developer is looking to use state-tax-credits in our area. Seems I’ve written about this many times here at Nathans News and tonight, I’m writing again. I have not seen official correspondence from the SC State Housing Finance and Development Authority; but earlier this month I received the letter above. VERY similar to letters in the past. When I hear from the state agency; I will again update everyone with the same instructions as in the past. Instructions to share your opinions with the agency. You may recall, while the project in our area did not receive the funding (in part due to our overwhelming feedback), a development in the surrounding area (Lake Murray Boulevard) was approved. Last week, I spoke with a reporter who asked about the changes in the Ballentine and surrounding area. I shared with him that it’s ovvious everyone wants to move here because of our outstanding schools and proximity to the lake and retail; we just need to be sure what’s being built doesn’t negatively impact our infrastructure and safety. While I never have a vote on local zoning issues, in my role as a state official (with SCDOT), I will work to help reduce any complications from growth in the area. I ask that each of you stay informed and give your input to the decision makers that approve the local zoning changes in the Town of Chapin, Town of Irmo, or on Richland County Council. Becoming a member of the Ballentine-Dutch Fork Civic Association is just one way to stay informed! Below are previous posts related to these proposed projects in our area. Ultimately, each project was not awarded state tax-credits and the developer then decided against building without them. Your input on proposed housing in Ballentine? Wanted to keep you informed of the proposed developments (The Park at Lake Murray, The Point at Lake Murray). Pictured above are the Preliminary Scores for each development. Obviously, too small to read. You can click here to review the scores. As I read the list, it appears 22 developments received higher scores than these two. I also notice that the proposals in Irmo (Lexington County) and Chapin (Lexington County) received higher scores than these two in our area. As previously shared on NathansNews, I’ve been there is only funding for 20 of the 42 submitted projects. Per the schedule on the SC Housing website , it is anticipated that notification of the Final Tax Credit Reservations will be made in late July to early August 2016. As soon as I hear if these projects received tax credits (or not), I will share with you! Nathan’s News readers will recall last month I shared the news of 2 housing projects proposed for our area . The Low Income Housing Tax Credit Program (LIHTC) is designed to provide an incentive to owners developing multifamily rental housing. Developments that may qualify for credits include new construction, acquisition with rehabilitation, rehabilitation and adaptive reuse. Owners of and investors in qualifying developments can use the credit as a dollar-for-dollar reduction of federal income tax liability. Allocations of credits are used to leverage public, private and other funds in order to keep rents to tenants affordable. Of the 42 projects that applied, funding will only be available for 20 projects. 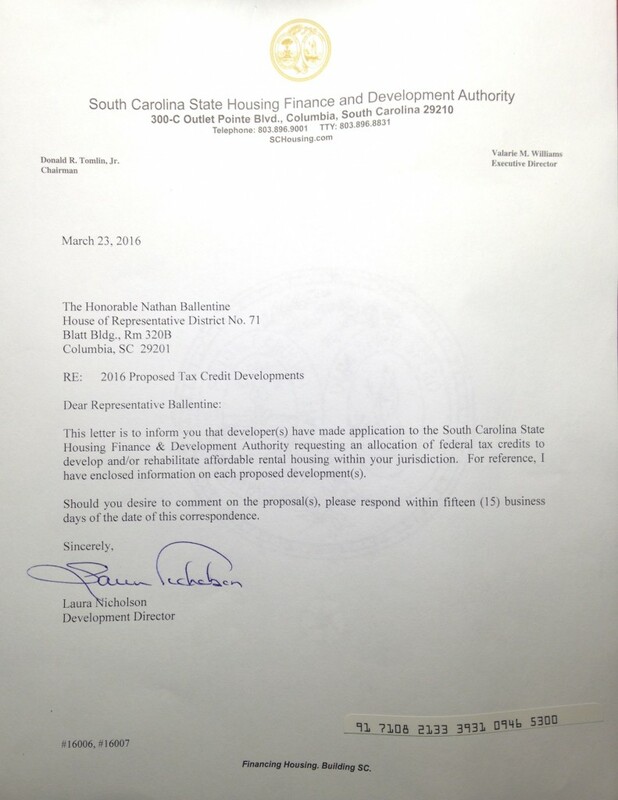 I appreciate your feedback here on the website, via email and particularly emails and letters sent to SC Housing. As usual, I will keep everyone informed. (Note: Very similar project was not approved years ago in our area). Readers may recall a few years ago, a federal-tax credit development was proposed for our area. By law, Members of the General Assembly are to be notified of applications made in their districts. These developments have been trying to pop up in Chapin and Irmo for some time. Including 1 currently proposed for Chapin. Just as I did years ago (and actually last month when I received a letter from a consultant working for this development group), I shared what you have asked me to share in the past. Our community does not have a need for these facilities nor do we have the current infrastructure in place to support it. We have a lot of growth as it is that goes unchecked or unquestioned at the county level. I’m glad members of the General Assembly are dialed in on these federal-tax credit projects so that we can speak for the community and not have a local council or commission approve a change without the community knowing about it. While I do not get a “vote” on these matters. I do get to share my response and ask that you share yours as well. There are currently more than 40 developments vying for tax credits. These 2 or our community along with 1 in Irmo (Lake Murray Boulevard/Lexington) and 1 in Chapin. 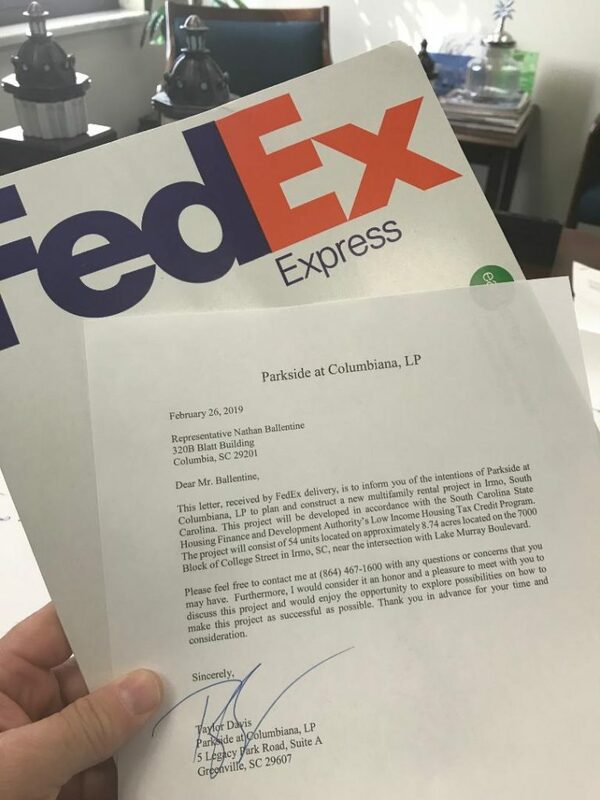 “The Authority is in receipt of your letter opposing the proposed development by Wendover Housing Partners, LLC called Bickley Manor (#13042) on a site across from Ballentine Elementary School. The Authority received a total of 65 applications fro proposed developments throughout the state as part of the Auhtority’s 2013 Tax Credit Application Cycle. The tax credit funding cycle is an annual competitive funding cycle which is governed by a document called the 2013 Qualified Allocation Plan (QAP). One of the requirements of the QAP is that the site be properly zoned for the proposed development and that the developer have site control. Both of these preliminary requirements have been met. As Applications continue on through the review process, they must also meet market and financial/underwriting criteria to ensure financial feasibility. Further, the QAP outlines other criteria all developments must meet in order to be considered competitive and are point scored using the same criteria. A copy of the criteria is attached ( Part One , Part Two ). At th eend of the review process, Applications having the highest point scores receive an allocation of tax credits. The Authority anticipates making aware announcements in July and anticipates funding 16-17 developments. From Nathan: I called the Authority again this morning and spoke directly to Laura Nicholson and Valarie Williams. They shared the same information that is listed above and attached. I wanted to also share my “takeway” from today’s conversations. 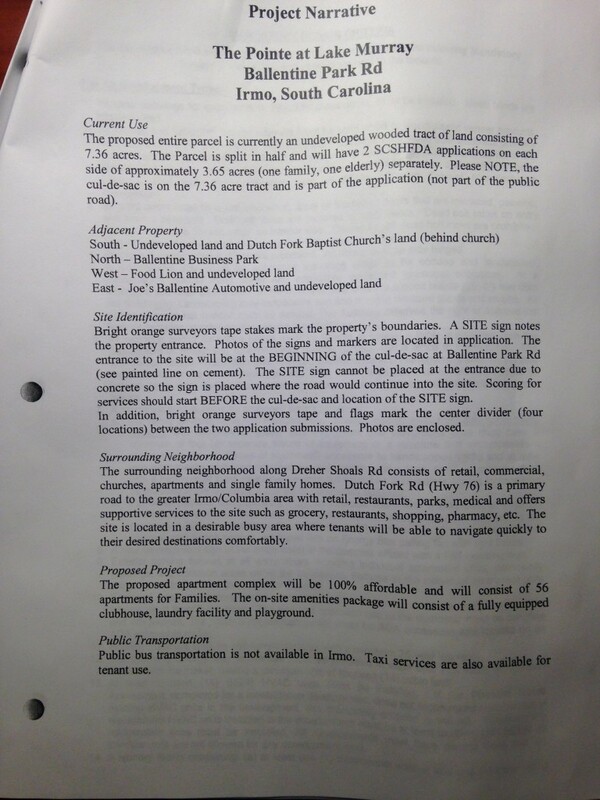 1) Apparently the land IS zoned for this development AND there is a current sales contract. Those are 2 of the “first hurdles” for developers. For those of us against the project (and I’ve yet to hear anyone from this area say they are FOR the project), this news is not good. 2) The “good news” I heard is that there are 65 applications throughout the state for these projects and the state will und between 16-17 projects. (Of course, that still means “there’s a chance” this happens but less likely than I had feared). Basically, one-in-four will get funded AND that assumes all 65 applications are scored with the same score such that all 65 are competing against each other. If 20 scored “perfectly” but Wendover did not; Wendover would not get the tax credit. I would feel that would severely change Wendover’s desire to build but would need to ask our local councilman to keep us informed if the contract for purchase of land still went through. 3) For those that clicked on the links above, you’ll see how these applications are “scored”. I was told last year out of 82 applicatinos, 65 had “perfect scores”. That meant only 65 of 82 projects were even considered. And of those 65 “perfect scores” the state only funded 15. 4) Our feedback is not a PRIMARY factor involved in the ‘scoring process’ but it will be taken into account in any “tiebreaker” situations. What I learned that meant was “all things being equal” (scoring of projects) those projects with OPPOSITION would not be considered for funding over projects that did not have opposition. What does this all mean (at least MY OPINION), this is obviously not a “done deal” yet (although I was concerned to hear the zoning is ok and there is a sales contract pending) and it appears to me there’s a long way to go for this out-of-state developer to get his tax credits approved. (Again, state should only have funding for 16 or 17 of these 65 applications; Wendover project being one of those 65). Please feel free to share your input (opposed or supportive) to the Authority as outlined in my earlier post last week. I will obviously work with our local County Councilman Bill Malinowski and our Senator, John Courson, and other area elected officials to keep everyone informed as I learn more. Below is an email I received from the Ballentine-Dutch Fork Civic Association. It appears it’s a forward from our local County Councilman, Bill Malniowski asking for your input on a proposed Housing Development in our area. As information, here is the letter I sent last week on your behalf. As Councilman Malinowski mentions, a letter from you can also help. This relates to the previous e-mails regarding the low income apartments they want to put across from Ballentine Elementary school. This would be 56 apartments of low income housing. There are already new apartments on 176 which have 316 units as well as new apartments on Marina Road of 216 apartments. The developers claim that their “market research” indicates this type of housing is needed in Ballentine due to the increase in “retail business”. Is this what you want your community to be for the future, consisting of continual apartments. This is not the right direction for our town of Ballentine. Please have as many people as possible IMMEDIATELY write letters of objection to the housing project across from Ballentine Elementary school. While it may not be possible to get them all in one envelope for a thicker, more impressive stack of letters, at least get them sent out ASAP. 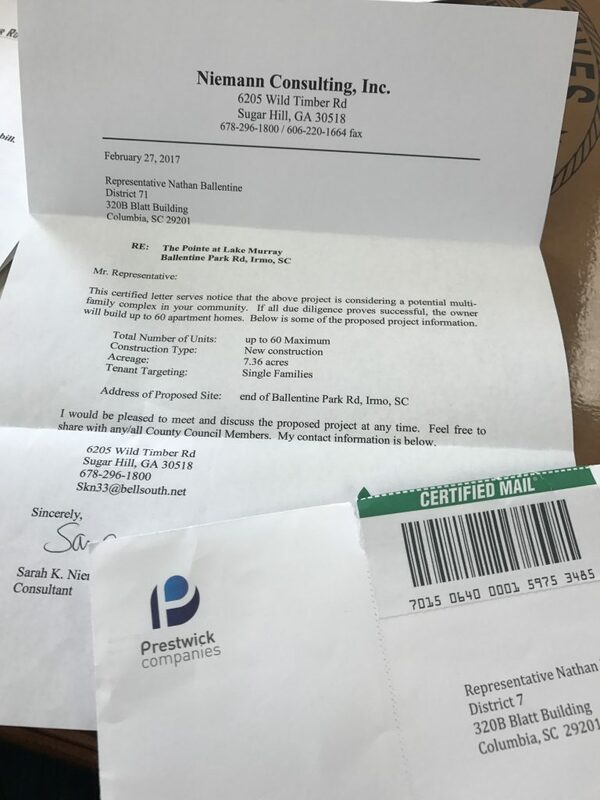 They should be addressed to Ms. Laura Nicholson, Development Director, SC State Housing Finance & Development Authority, 300-C Outlet Pointe Blvd., Columbia, SC 29210. 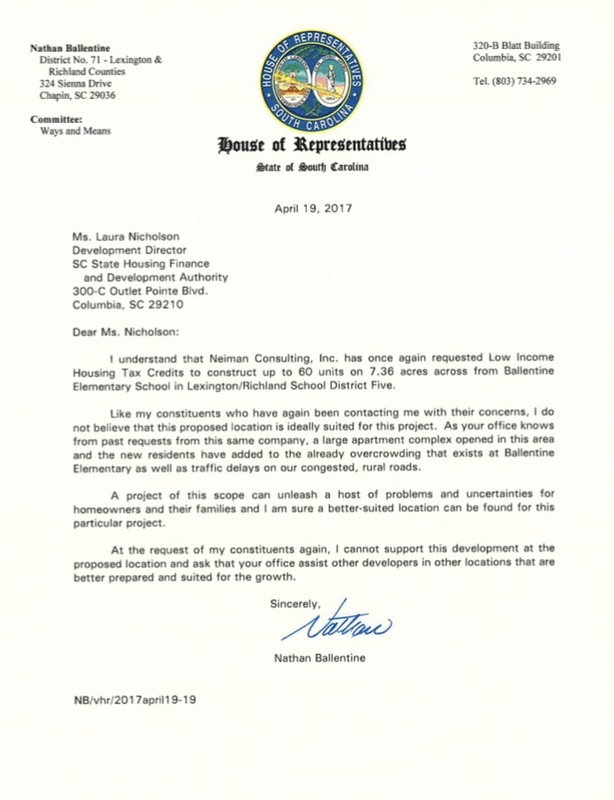 The letter should state why he/she feels Wendover Housing Partners, LLC of Altamonte Springs, Florida should be denied their request for Low Income Housing Tax Credits to construct 56 units of just over 3 acres across from Ballentine Elementary School. Some of those reasons could be the overcrowding of schools already at or exceeding capacity, increased traffic delays and congestion, the lack of need for this type of housing in the Ballentine area, and no public transportation to get residents to jobs that will obviously be located somewhere else in the Midlands area since there is no real job market here. If you had time to review the market research/analysis conducted the person who did it is comparing the need for this type of housing to already existing and filled developments in the Harbison area, stating it is only 6 miles away. That is a totally ridiculous comparison in an effort to skew the figures. It would be like saying a need for low income housing exists in Shandon or Forest Acres because they need it in W. Cola or Cayce. Since their application was due at the Authority by last Friday get those letters out now. We returned this week to finalized next year’s budget (which ultimately passed 84-28 in the House and passed 30-9 in the Senate). In the coming days, Governor McMaster will get to issue his vetoes – and I look forward to seeing many of those and hope we can sustain those that are not the best use of your tax dollars. If you ever wanted to dive into the budget, here it is. 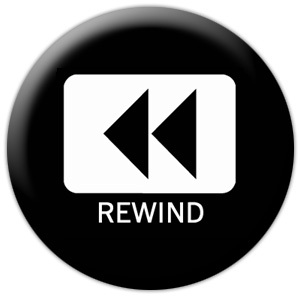 Click and “enjoy”. Below are some highlights for the areas most often asked about by constituents. of the state through services such as the iCARED initiative. The House of Representatives amended, approved, and sent the Senate H.4182, the “STATE INSTITUTION OF HIGHER EDUCATION EFFICIENCY ACT”. The legislation establishes a process that allows South Carolina’s public universities and colleges to exercise greater authority and bypass state regulatory oversight, including approvals by the Commission on Higher Education and the Joint Bond Review Committee, when undertaking capital projects and making investments utilizing funds that are not derived from state appropriations or undergraduate tuition in auxiliary activities related to research, housing, food services, stores, and athletics. The legislation makes provisions for annual reports on the financial activities of higher education auxiliary divisions and audit requirements to insure that their financial arrangements and borrowing is not secured by the state. An institution of higher learning may adopt a procurement policy for an auxiliary division’s purchasing and contracting, which, upon approval of the policy by the State Fiscal Accountability Authority, exempts the division from the South Carolina Consolidated Procurement Code. The Commission on Higher Education retains its oversight authority over core functions, such as the approval of new academic programs. Purchases, borrowing, and financial transactions using state funds remain subject to state regulatory protocols through such oversight bodies as the Joint Bond Review Committee and the State Fiscal Accountability Authority. The legislation applies to the Citadel, Clemson University, Coastal Carolina University, College of Charleston, Francis Marion University, Lander University, the Medical University of South Carolina, South Carolina State University, Winthrop University, and the University of South Carolina’s main campus in Columbia and its Aiken, Beaufort, and Upstate campuses. H.4421, a bill facilitating the more expansive use of SOLAR POWER AND OTHER DISTRIBUTED ENERGY RESOURCES by customers of investor-owned electric utilities, was rejected at third reading, having failed to receive the two-thirds affirmative vote that Article X, Section 3 of the South Carolina Constitution requires for the approval of a property tax exemption. The House approved S.1101 and enrolled the bill for ratification. The legislation EXTENDS PROVISIONS DISALLOWING THE USE OF EMINENT DOMAIN POWERS BY PRIVATE, FOR PROFIT PIPELINE COMPANIES, including publicly traded for profit companies, that are not defined as a public utility so that these provisions are set to expire on November 30, 2020, rather than the original sunset date of June 30, 2019. The extension affords additional time for the temporary Petroleum Pipeline Study Committee to report its findings and recommendations to the General Assembly. The House approved S.340, revising the APPOINTMENT OF SOUTH CAROLINA’S POET LAUREATE by the Governor, and enrolled the legislation for ratification. In making an appointment, the Governor is required to select from a list of qualified candidates recommended by the South Carolina Arts Commission. A four-year term is established for a poet laureate who may be reappointed to serve one additional term. The poet laureate shall respond to requests of the Governor and participate in other relevant public programming. The House approved S.796 and enrolled the joint resolution for ratification. The legislation creates a SOUTH CAROLINA AMERICAN REVOLUTION SESTERCENTENNIAL COMMISSION to plan and execute a proper observance of the upcoming 250th anniversary of the Revolutionary War and South Carolina’s role in attaining American independence. The House approved and sent the Senate H.4799, a bill providing authorization for South Carolina to join the multi-state PHYSICAL THERAPY LICENSURE COMPACT to facilitate interstate practice of physical therapy with the goal of improving public access to physical therapy services. The House approved and sent the Senate H.3684, a bill authorizing the Department of Revenue to implement INTERNET FILING AND INDEXING OF TAX LIENS for public inspection online. Replacing the existing system of filing tax liens with county clerks of court, the legislation allows the Department of Revenue to implement a centralized system of filing and indexing liens which is accessible to the public over the Internet or through other means. The House amended, approved, and sent the Senate H.5145, a bill facilitating the issuance of DRIVER’S LICENSES THAT ALLOW DEPLOYED MILITARY PERSONNEL TO OPERATE MOTORCYCLES while stationed abroad. The legislation directs the South Carolina Department of Motor Vehicles to contract with the United States Department of Defense to administer Class M driver’s license examinations for active duty military members assigned outside of the contiguous United States. The House approved and sent the Senate H.5231, a bill restoring revenue generated from the sale of recreational and commercial marine fishing licenses, permits, and tags to the MARINE RESOURCES FUND. 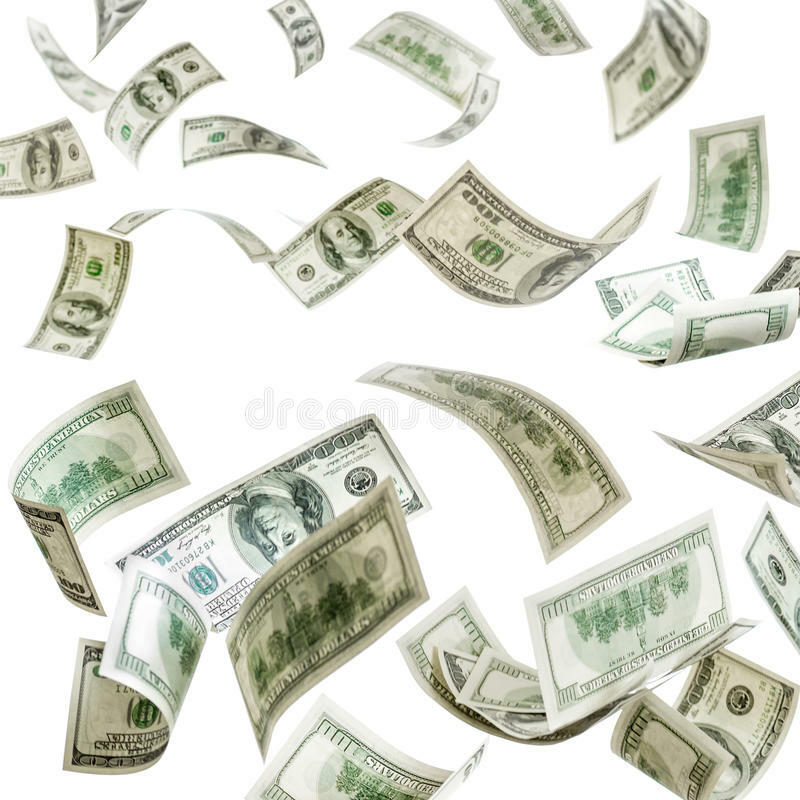 The legislation discontinues the practice, adopted during the revenue shortfalls experienced during the recession, of diverting a portion of the funding to support law enforcement activities at the Department of Natural Resources.